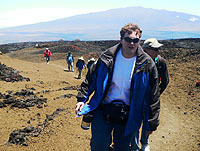 This hike is a part of our Mauna Loa Summit Scenic Drive trip. We describe here two ways to get to North Pit, on the north end of Makuaweoweo, the summit crater. 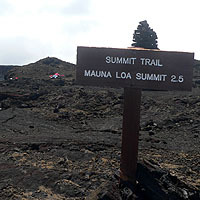 We also describe two ways to continue on to the summit itself - all from the Saddle Road side of the volcano. Looking back at our troupe, Mauna Kea looms behind us. Jaggars Pit offers shelter in storms. A pocket of ice on the far caldera wall survives into July. 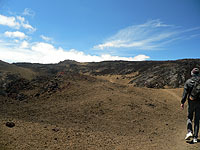 A view across the crater floor. 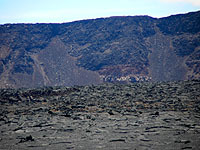 Far side of the caldera wall. One of our party explores the crater floor. The end of North Pit is the start of 2 other trails. Cabin trail, takes you to the crater rim cabin. Summit trail, takes you on to the summit. 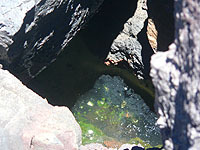 A waterhole provides emergency water. 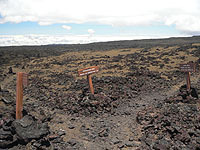 The summit of Mauna Loa is accessible from a number of directions and by using a number of trails, most of which are within the Hawai'i Volcanoes National Park. 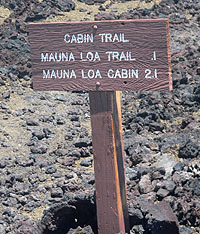 Most of the trails go up on the Eastern and Southern sides of Mauna Loa, to the side opposite the summit itself where a cabin sits on the crater edge. 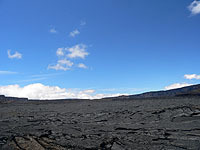 On the northern side of Mauna Loa is a single trail that is mostly outside the National Park, which goes from the Mauna Loa Observatory at 11,146 feet all the way to North Pit, the northern most edge of the summit crater. This 6 mile trail can be approached from a number of different entry points making the actual hike anywhere from the full 6 miles to as short as a half mile or less. Once you reach North Pit an additional 3 mile hike takes you to the true summit of Mauna Loa, along the edge of its giant and spectacular crater. 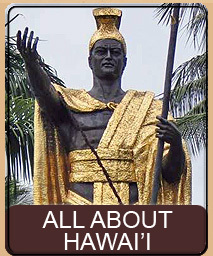 The drive to this hike is fully described in our Mauna Loa Summit Scenic Drive. Please refer to the drive details for reaching this hike. 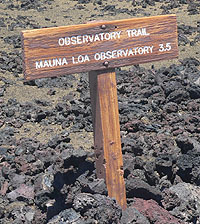 Once you reach the 11,146-foot altitude at the Mauna Loa Observatory there are two choices for taking summit trails. The first choice requires a 4-wheel vehicle; the second choice does not. 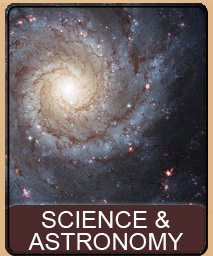 We will present both methods in this hike. If you intend to hike the entire trail you should be an experienced hiker. You will need to bring enough food, water, and survival gear to handle being stranded overnight should weather conditions turn. Regardless of how much of the trail you intend to do, estimate a walking speed of around a mile per hour. Bring warm clothing as the summit temperatures can reach 0° or colder. You should have good shoes or preferably, boots. Sunscreen, a hat, and sunglasses are a must as there is no shade. Bring water and snacks, and of course, a camera. 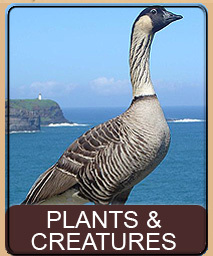 The Mauna Loa Scenic Drive review contains a list of cautions and warnings for the drive up to the trail. 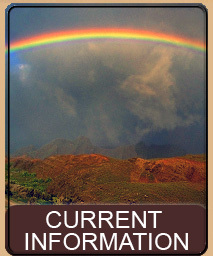 This includes very important high altitude warnings that you should read and follow. Be sure to read the Scenic Drive page carefully along with the additional information and warnings on this page. In addition to the Scenic Drive warnings the greatest dangers on this hike include high altitude sickness and disorientation, dehydration, sunstroke, injury due to falling, and sudden change in weather. Drink plenty of water on this hike; being at altitude in the dry air means you will dehydrate quickly. Do not stray far from the trail. It is easy to lose track of the trail if you should wander, as Mauna Loa has no distinct directions. Furthermore, shallow lava tubes present a danger for cracking through the roof of and falling into. If you wander from the trail, and fall and injure yourself, it would be very difficult for you to be found by rescue workers. If the weather should turn to rain or snow such that you lose visibility, find a sheltered area near the trail where you can be protected by the weather. Mark the position and distance to the trail so you can find it even if there is snowfall. Wait out the elements rather than try to walk out in obscured weather. As we stated earlier, this trail is actually doable from several different points along the trail itself. Depending on your vehicle and your energy - you can take either the entire 6 mile trail, or as short as a half mile or less. If you're really energetic you can add the additional 3 miles to the summit itself. The trail begins where the Scenic Drive meets the Mauna Loa Observatory at 11,146 feet above sea level. Just below the observatory is a small public parking lot. If you do not have a 4-wheel drive vehicle than this is where you will start your hike and you will be doing the full 6 mile hike (one way). In this case, park your car in the public lot and continue on foot, past the end of the rough paved road and onto the 4-wheel non-paved road. After a very short distance you will encounter the trailhead on your left - but most hikers pass this and continue along the 4-wheel road for about a mile where the road again intersects that trail - it is this point where most hikers leave the road and begin the hike to North Pit along the Mauna Loa Observatory Trail. If you came equipped with a 4-wheel drive vehicle that meets the requirements we put forth in our Scenic Drive warnings, than you can cut your hiking time to a minimum. Following our directions in the Scenic Drive, take your vehicle to the Hawai'i Volcanoes National Park gate way up on the 4-wheel drive road. If the gate is locked, as it was the day we did this particular hike, you should park here. Facing the gate, there is a small lava tube on your left (dangerous, do not climb, very thin roof that has already collapsed once, hurting the climber) and on your right, a slightly larger hill. Walking back along the road, away from the gate, you will notice that the trail comes right up to the road just in front of this larger hill, and goes around and behind the hill. This is where you are going to start your hike - and from here it is slightly more than 3/4 of a mile to the edge of North pit. Should you have the good fortune of finding the gate unlocked (it might be closed, if so, open it) drive on through and continue up the 4-wheel road. After a short distance you will again cross the trail. If you park at this location you are a very short quarter mile to North Pit - so it might make sense to park here, enjoy the view from North Pit, and then walk back to your car and continue driving to the summit. The summit is about 3 or so miles up and ends at a small outdoor scientific station. Park near the station and then walk the final 500 yards or so to the summit itself (you are actually just shy of the summit, which, when facing the crater, will be up a bit to your right). If you were unlucky to find the gate locked, and you walked to North Pit, you can continue your walk another 3 miles to the summit itself, if you wish. To return just retrace your steps. Ok, so much for the different places to meet the trail - what you will see depends greatly on where you picked the trail up. 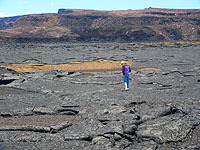 Most of the trail goes through differing sections of colorful pahoehoe lava flows, skirting the more difficult a'a flows. Vibrant cinder cones surround you as you continue upward towards this summit. 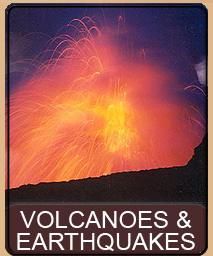 The footing varies from hard lava flow, to small cinder and even a few sections of fine ash. You will find a variety of lavas including some with large specimens of the semi-precious gemstone olivine (peridot). A view of the colorful landscape as we walk up the volcano. If you are relying on the older maps showing the summit trails you will become confused in spots where the trails have been reworked. In a number of places the trails do not make turns as indicated on the maps, and in one section the trail has completely been rerouted to take you around, instead of up and over a large steep hill. In the last three years we have gone up a total of three times. The first two times we found the gate unlocked and drove to the summit itself. This particular time the gate was locked. On this trip we were also accompanied by two other vehicles containing friends and co-workers as well as two hikers who wanted to do the North Pit and summit segments. Stuck at the gate we all decided to walk to North Pit together. To say that the walk is exhausting is to put it mildly. While there is nothing particularly grueling about the walk itself, the high altitude and decreased oxygen makes even simple movement difficult and slow. From the gate, the trail goes steadily upward, skirting around various small hills and cones. After a bit the trail crosses the road, after which it is only a quarter mile further to North Pit. The crater at the summit of Mauna Loa is a spectacular large oval, with several connected pits to the south. The main crater is about as large as Kilauea Caldera making features on the other sides very far away and small. As you approach the caldera from the North Pit side, you really don't realize that you are approaching the crater as you are still climbing up the side of the volcano. Then, suddenly, the trail abruptly stops and you are at the edge of the giant summit caldera. The view from North Pit is much different than the view from the summit. The walls of the crater at North Pit are very shallow, only a 6 to 10 feet above the crater floor - whereas the summit itself has walls several hundred feet above the crater floor. What this means, of course, is that North Pit is an excellent place to scamper down into the crater floor, and explore the caldera itself. In fact, the end of this trail is the beginning of 3 other trails, on of which takes you across the caldera and up the southeast flank to the cabin on the crater rim. When we arrived at the summit, other hikers whom we had passed on the road were already there (yes, that's right, even though we passed them they beat us to North Pit - mainly because the trail is much shorter than the road). Our group of 11 fanned out and relaxed, breaking out refreshments. After a bit we began to explore the immediate area. Just back from the caldera edge is a large man made shelter constructed out of crude lava rock. 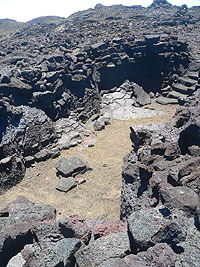 The shelter has been hewn out of lava rock and then extended upward with rock walls, and even has hewn stairs descending into the pit. Known as Jaggar's Pit or Jaggar's Cave this structure provides adequate protection from wind and driving rain, but not much protection from falling snow. Near the entrance to the pit is a natural waterhole, and on the balmy July day we were here the waterhole had water in it with quite a bit of ice further back in a crevice. The water, while not looking totally clean, would certainly be drinkable once boiled or otherwise purified. In fact, looking at the far wall of the caldera we could also see another spot of ice, somehow surviving the summer temperatures in this harshest of climates. If desired, you can continue the trail to the summit or just walk along the rim of Makuaweoweo until you reach the summit, about 3 miles to your right while facing the caldera. 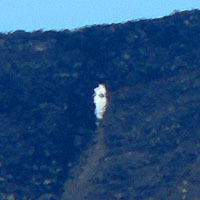 The summit offers a totally different view, with the caldera floor hundreds of feet below you. 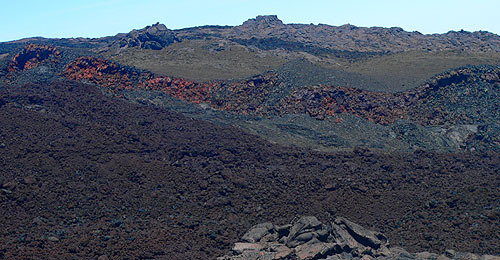 Another smaller cinder cone, in the center of the caldera, rises a few hundred feet from the floor and from the summit angle, resembles a perfect Hershey Kiss in a huge vat of chocolate. On one of the occasions when John and I drove to the summit, the weather was so warm that we were soon in shorts only, sunbathing at 13,676 feet - something one rarely gets to do up there. When we took out our cell phones we were surprised to see we had a signal. Calling friends to say "guess where we are right now" ended up in a surprise when the phone bill came, as all our cell calls were picked up on Maui, not the Big Island! The walk back down is much easier, as can be expected, than the walk up, not to mention much quicker as well. On this occasion our group passed even more hikers coming up, as we descended back to our vehicles at the gate. Turning around we took the alternative road out of the summit (see the Scenic Drive for more details). All in all, the hikes to the summit (or even, the drive to the summit) are spectacular and should not be missed if you are the rugged hiking type. 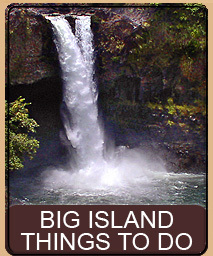 For those of you without the stamina, but with good 4-wheel vehicles, doing even the hike from the gate is well worth the time to see this very special and hidden feature on the Big Island. From the summit looking back at North Pit. From the summit looking south towards South Pit and the Hershey Kiss in the middle. From the summit, looking straight across. The little bump on the other side is the summit cabin. Another view towards South Pit. John gives a short blessing before offering a Lei to the volcano. 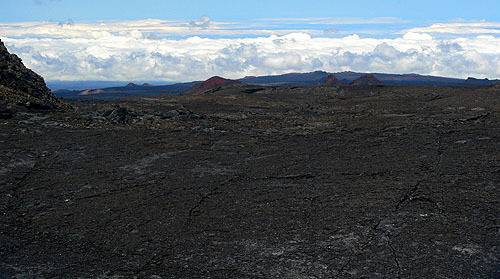 A view looking towards Hilo, from near the summit, shows the rift zone. move the mouse left, right, up and down to pan the image. This page is named 'Hikes.loa'. Can't Find It?